Happy Thursday, everyone! With the holidays coming up soon I thought I’d share these new Valentino pumps I got that I know I’ll be wearing all season long!! Here I’ve dressed them down with a distressed pair of denim jeans and an oversized sweater but I’m getting excited to dress them up for all of our holiday parties we have planned! A red pump is a holiday staple and always my go-to during the Christmas season. Below are some more red pumps from Nordstrom of all price points perfect for the holidays! Absolutely gorgeous pair of heels, love them! These pumps really beautiful. Great point in matching your accessories with your lipstick. Red always makes it feel more like the holidays. I have this sweater too! It’s the best! Love how you styled it with those gorgeous shoes!! You are nailing the comfy knit sweater recently. Love the sweater! Love this look!! It’s so cute and those shoes are amazing!! Gorgeous look! The red bag is the perfect pop of color!!!!!!! Fabulous sunnies and bag! You’re having a great sense in fashion, def. one of the most stylish mommies ever! I love this pop of red! The Valentino Rockstuds are amazing and so pretty in red! The pop of red is perfect in any season! You look gorgeous! Love those heels! Oh my gosh the red Valentinos are amazing! They are Leanne! Perfect for the holidays! Red is totally your color!!! Woooow these shoes are my dream!!!!Gorgeous!!! Look at all those gorgeous leaves! Such a pretty backdrop! Those heels are gorgeous! 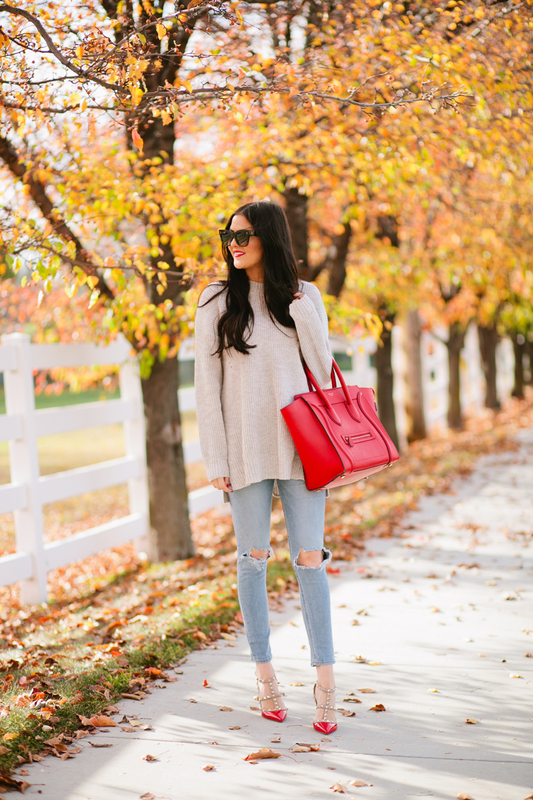 Love how you dressed them down with distressed jeans and an oversize sweater. But dressing them up for the holidays will be even more fun! Thanks Holly! I am so excited for the holiday season and to dress up! I would love to see those shoes under my Christmas tree! Lovely pops of red Rachel! That purse and shoe combo is stunning. Those Valentino heels looks gorgeous in red! Love them! This outfit is gorgeous and red is also one of my favorite colors for this season! Rach, I’m loving these pops of red! 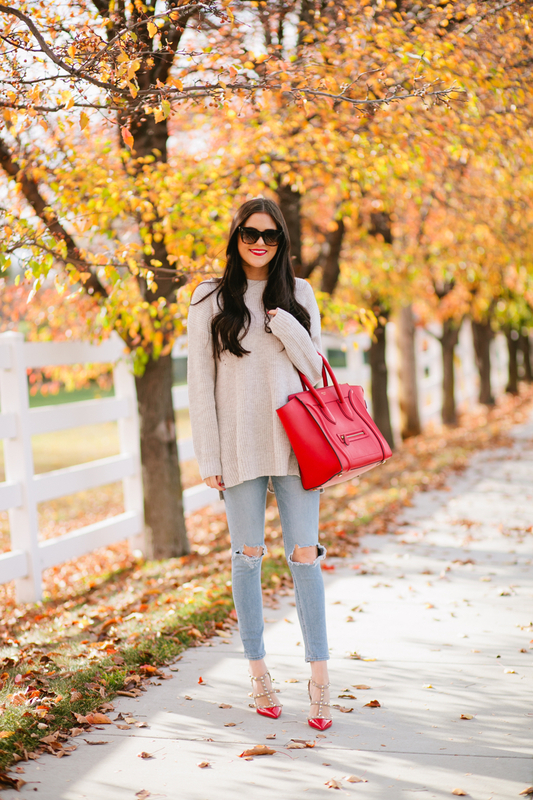 That sweater looks so cozy and I’m swooning over both your shoes and that Celine! Thanks so much for sharing, beauty, and I hope you’re having a great week so far! 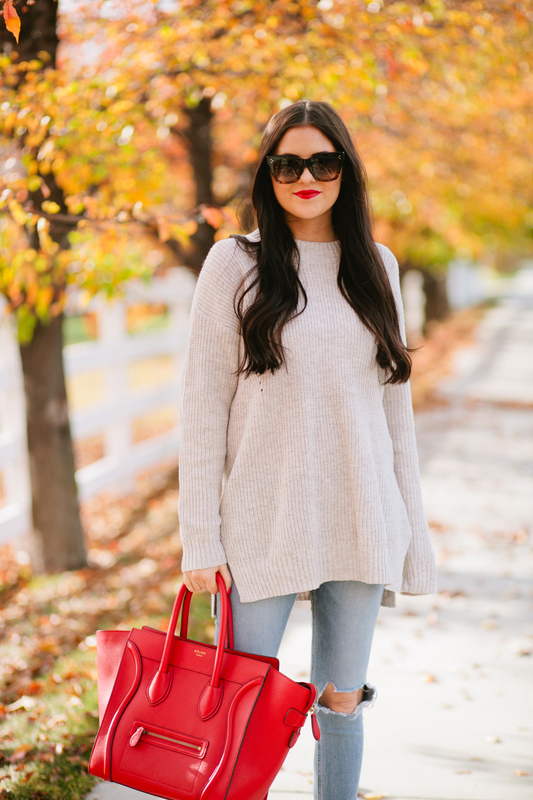 Loving this cozy, classic fall look! So beautiful! I love red, and not only during the holidays! :) These shoes are gorgeous and just the perfect pop of color – I love how you styled them! 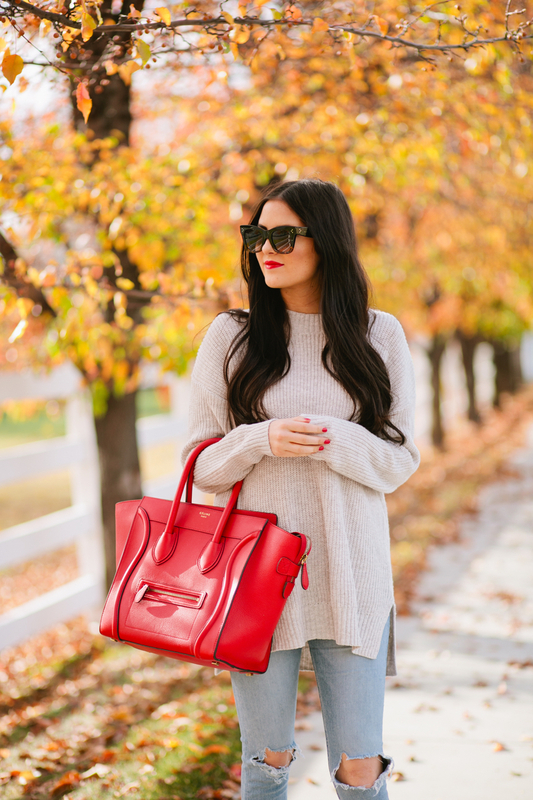 I’m really loving red lately and this is the perfect way to pop it into an outfit! Wonderful photos!! I’m loving the red. You always have the best red accents! I always try to take a page out of your book since we have similar coloring. Love the purse! Perfect color for the holidays. I love the sweater! What size did you order? I like the fit on you, and the reviews say it runs big. Trying to get an idea of what size to order.